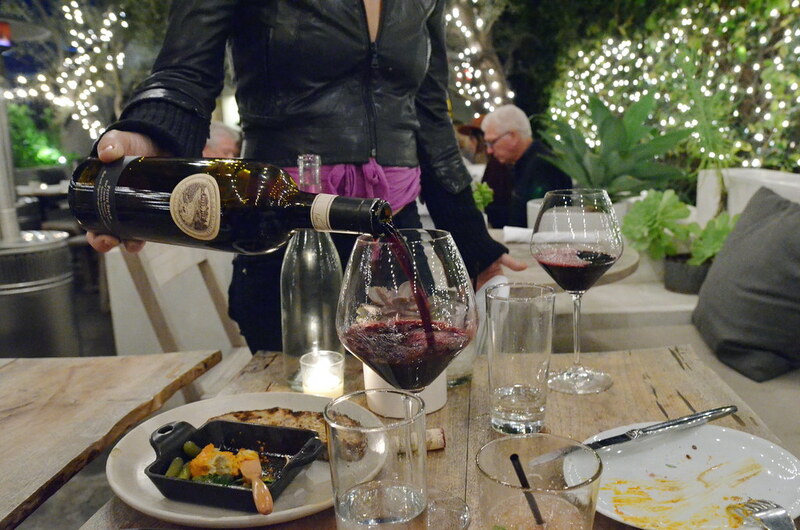 Under the twinkling trees and against the rustle of climbing ivy, we perused the wine list. Our fingers faltered over a lovely 2013 Preston Petite Sirah (Dry Creek Valley, Sonoma​ County, CA) that was so nice we ordered it twice. From day one, at the top of the Santa Monica Mall, Plant Food and Wine has been serving these Kimchi Dumpling ($16). 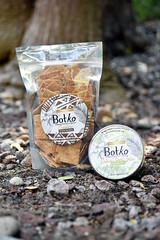 Dehydrated cilantro and coconut skins folded over a soft paste of fermented kimchee, cashews, tahini, and ginger. 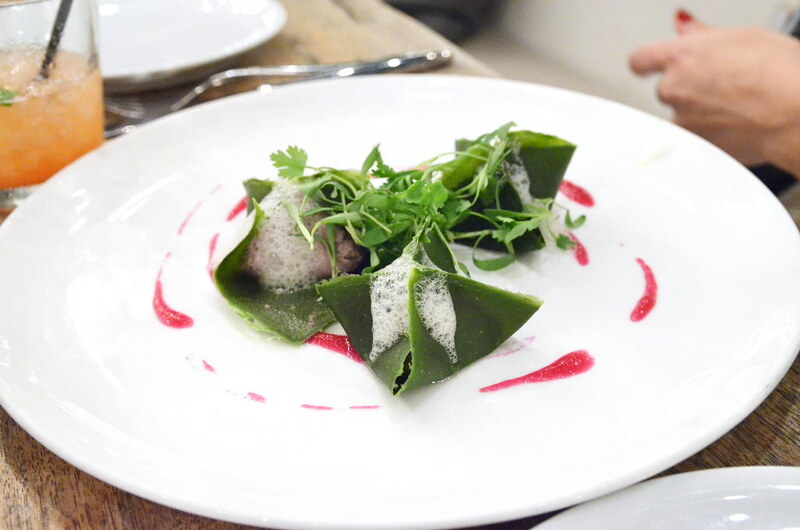 The plate is finished with dollops of ginger and sesame milk foam, micro greens, and a twirling flick of red cabbage puree thinned out with kimchi juice. While the name implies heat, there is none to be found in these tender—almost sweet—bites now served in a non-mall atmosphere befitting of the price point. 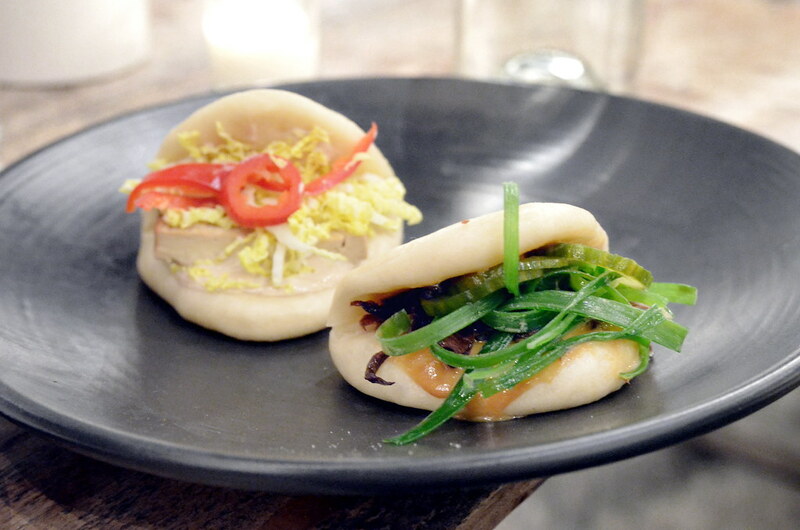 Two Chinese-style folded rounds of sweet white bread with a tacky glaze make up The Steamed Buns ($14). The fluffy bread is folded around A: Smoked tofu, napa cabbage, and pickled chili with a miso mustard; B: Oyster mushrooms, scallions, and pickled cucumber with a cashew hoisen glaze. I can see how these complex yet delicate flavors made their way to the menu. Priced at $7 a piece, I also understand why they are no longer there. 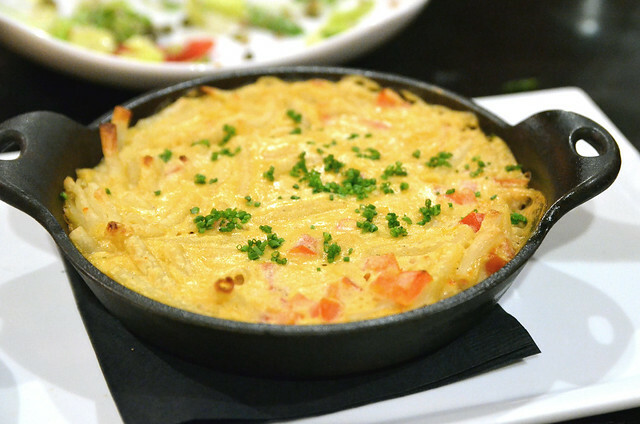 Though the Cashew Raclette ($14) does not remotely resemble the gooey lava flow of a traditional raclette, the warm cultured cashew creme, glazed in tart brine, melts into the crevasses of the grilled slices of Lodge Bread. Petite gherkins and a radish-parsley garnish drives this dish further from it’s namesake and deeper into likability. 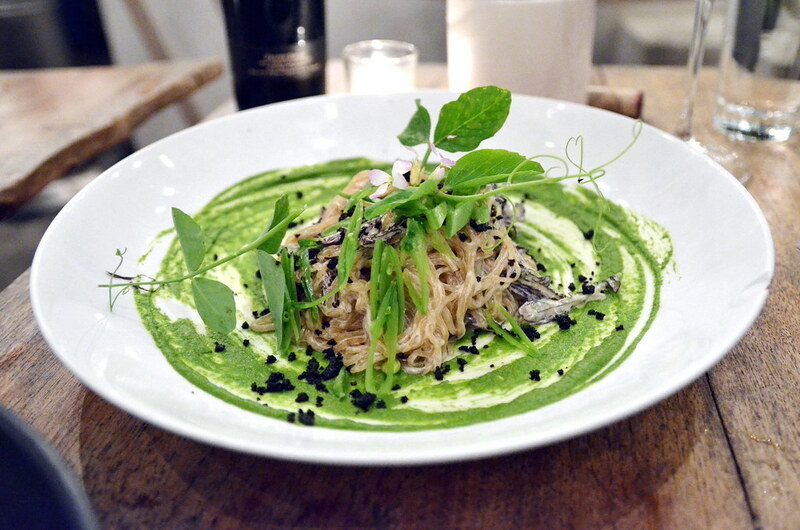 A man-bun of marinated kelp noodles slick with black pepper cashew cream, slivers of sweet snap peas, and delicate curls of pea tendrils make up the Cacio e Pepe ($21). 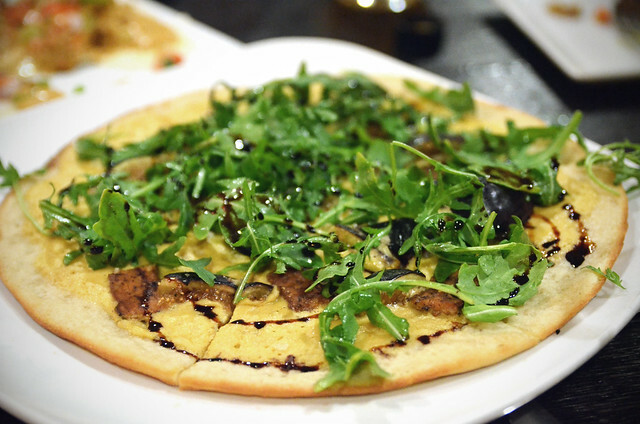 A swath of pea puree lays base under the sandy sprinkle of crisp, oil-cured, olives and pink arugula flowers. A hardier dish for warmer weather, the Butternut Squash Gnocchi with Farro Bolognese ($24) offers carbs dressed in delicate micro greens and arugula flower. Tender potato dumplings melt into a creamy butternut squash sauce that no one will walk away hungry from. This is a whole serving of the Apple Pie with Caramel Ice Cream a la mode ($12). That’s not meant as a jab, I’m just stating fact. 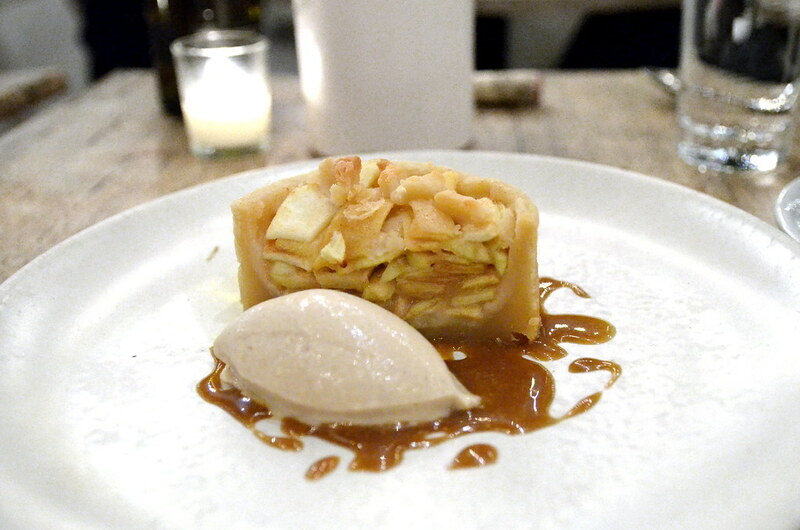 The raw half-pipe of pastry shell is layered with tart peeled apples with cinnamon, caramel sauce, and a quenelle of rapidly melting ice cream. 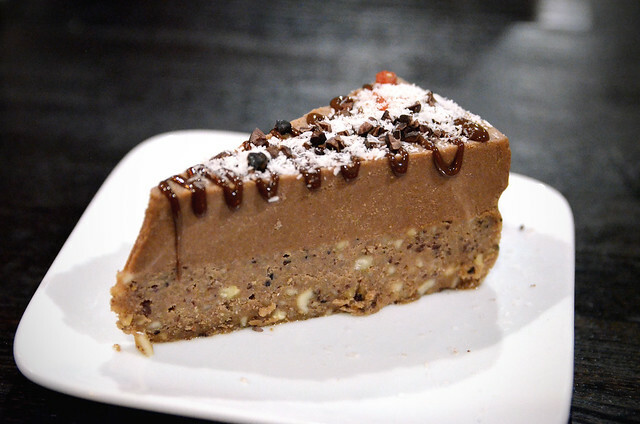 I’ve repeatedly lamented the state of vegan desserts in restaurants but can say that at least this one is making an effort to be interesting. 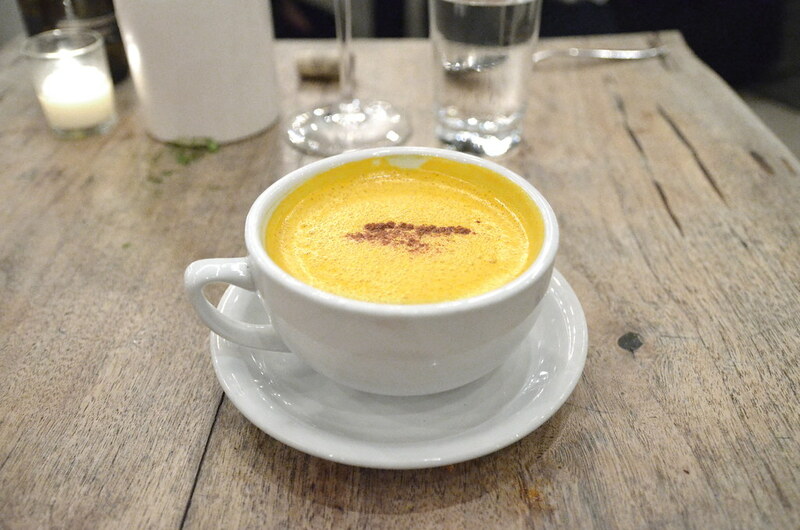 To wind down the wine we shared a Turmeric Latte with frothy house-made almond milk laced with ginger. While overall the dishes at Plant Food and Wine were quite good, at the end of the evening prices gore everyone’s bank account. While food quality and knife skills are what we’ve been groomed to believe we are buying, what one actually buys at Plant Food and Wine—and at any fancy high end restaurant—is status. The right to see and be seen sitting here, high in the corner booth, cocooned by twinkling lights and fluttering olive leaves on one of America’s most exclusive streets. We are the ones who have made it. Who through hard work and moxy—but mostly blind luck and inheritance—get to congratulate​ ourselves on making the good choices in life. A sputtering fountain in the shadow of the Disney Music Hall marks the entrance to the softly open Au Lac DTLA. 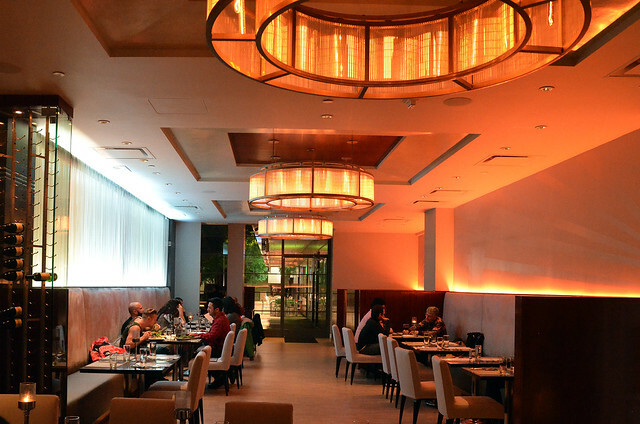 Retaining the opulence of the former First & Hope, the modern Art Deco dining room is a refreshing upgrade from the Fountain Valley location. We take our seats in the dinning room as Chef Ito takes the helm of the kitchen. From there he executes a handful of favorites plus a few new tricks. Still in the dawn of the restaurant (official opening on January 1, 2015), Chef Ito’s working menu promises many more new item to come. 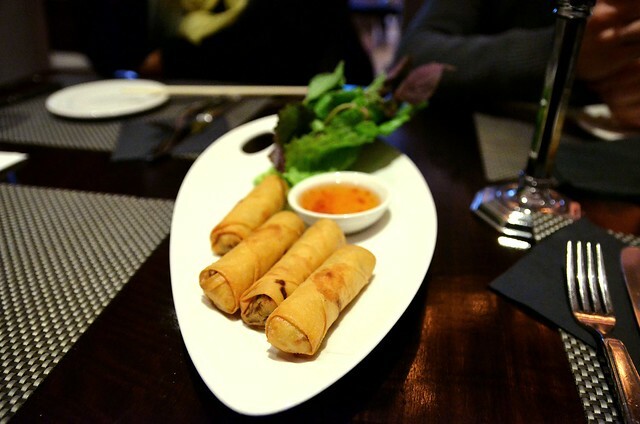 Stuffed with mushroom, taro and carrot, the eggless Eggrolls are served with lettuce, mint leaves and soy fish sauce. These rolls are simple with a light but tight interior. 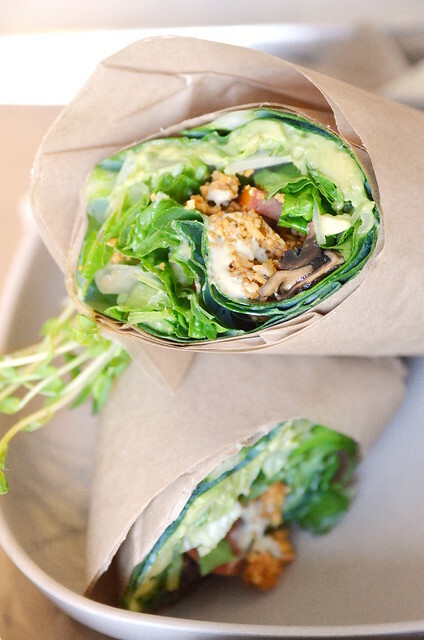 The greens, confusing at first, are used for gripping the rolls and lighting the oil fried wraps. 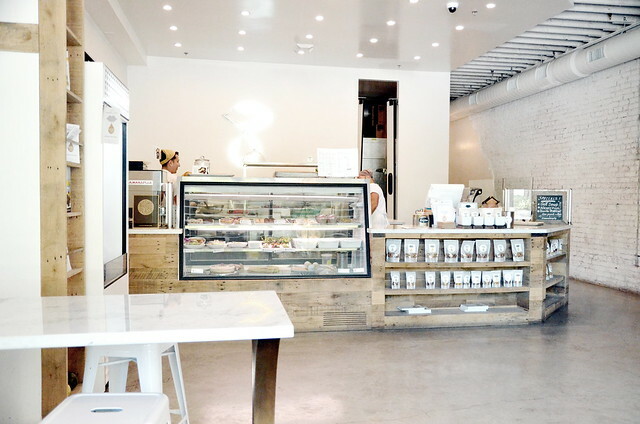 Vegan sushi in Los Angeles is a tricky subject, many strong opinions exist, and I frequently find myself in the minority (aka: I think Sojin is just okay). 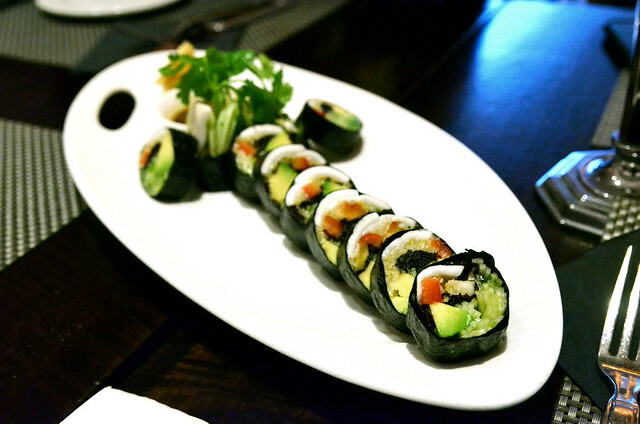 So with that caveat, I say Au Lac’s varietal of raw vegan sushi is some of the best in Los Angeles. 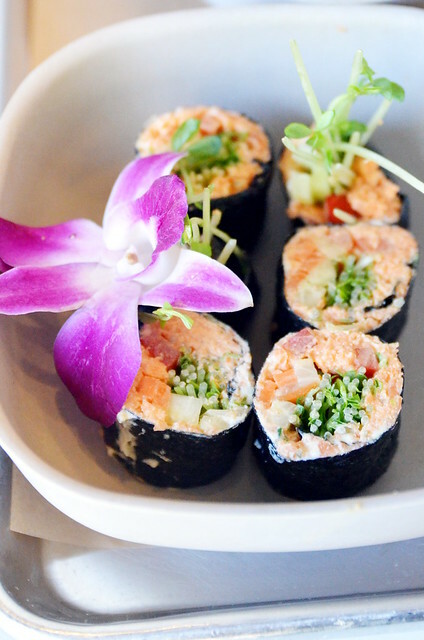 While I prefer Chef Ito’s Dragon Roll, the Cali Roll filled with pine nuts, dulse, bell pepper, cucumber, avocado and coconut flesh wrapped in nori is light, crisp and delicious. 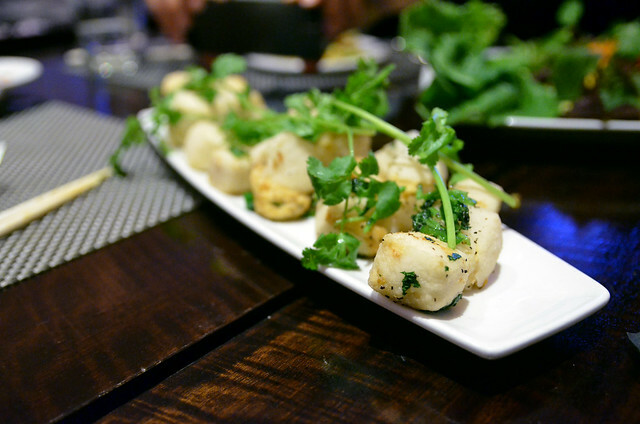 My go-to dish has always been the Salt & Pepper Tofu, creamy tofu lightly battered in a saline shell. Peppered with jalapenos and sprigs of cilantro, this delicate dish comes off as bland if you don’t take time savor each bite and let the salts develop… like a Polaroid picture. Raw rice is a real thing… I had no idea. This Curried Rice starts with soaked organic wild rice tossed with broccoli, cauliflower, peas and corn tossed in spiced macadamia sauce. 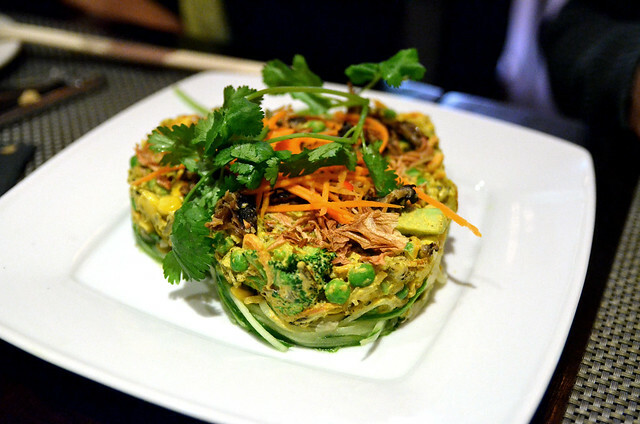 It is served over avocado, olives and cucumber and topped with marinated mushroom, crisp onion, carrots and cilantro. 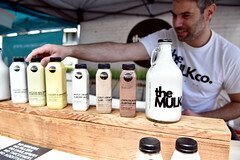 It’s a lot of elements, a lot of flavors and a lot of goodness. 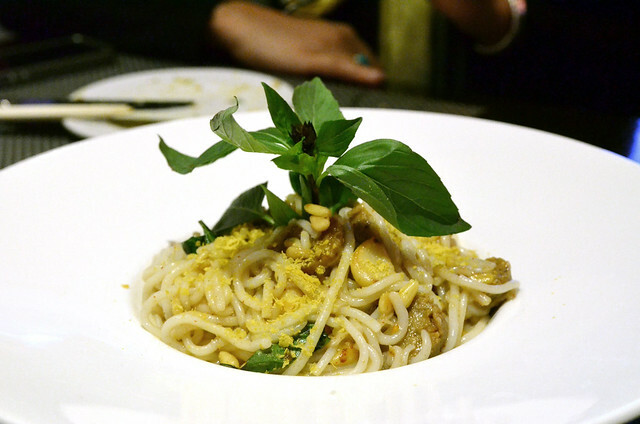 The Downtown menu includes the new Garlic & Basil Noodles. Slippery brown rice noodles are tangled with pinenuts, large cloves of roasted garlic, nutritional years and apple sage sausage (or your can sub veggies for a gluten free option). The best dish of the entire night–nay the entire menu–is the Tostada. The sweet cornmeal shell is piled high with shredded cabbage, macadamia cheese, ground mushroom, salsa, dill-ranch sauce and cilantro. Complexly layered with savory and sweet element, this dish is very share-able but I’ll likely be ordering one all to myself from now on. 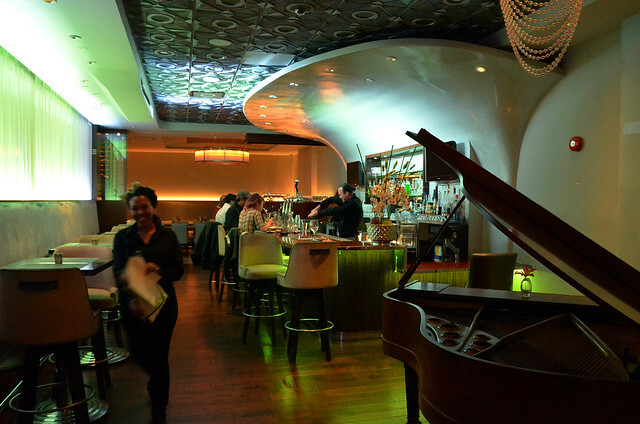 In addition to the new menu, Au Lac DTLA also has a full bar, complete with mini grand piano and crystal chandeliers. 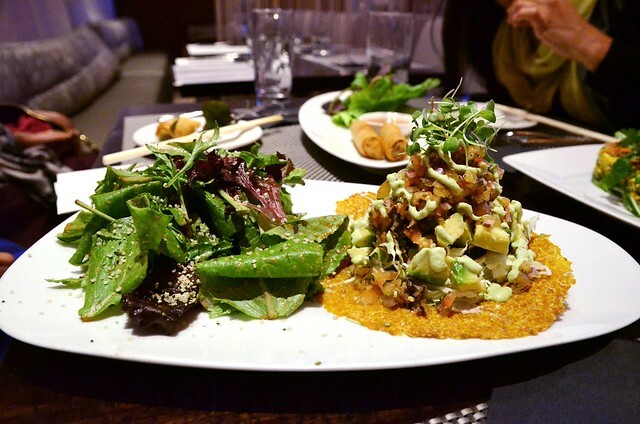 This beloved Orange County institution is a welcomed addition to the DTLA vegan dining scene. 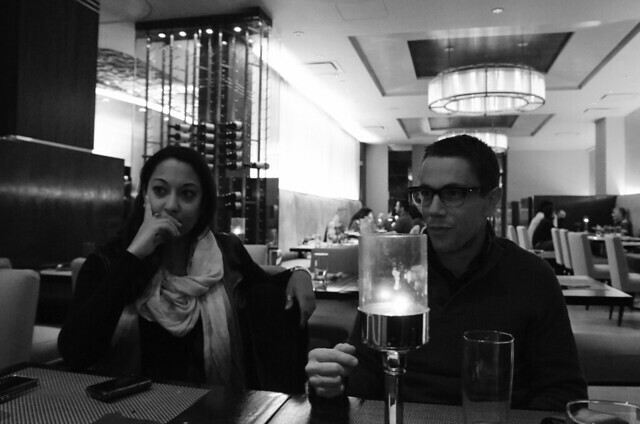 Thanks to my dining crew: Elana, Tim and Alice! Life changed a lot this year. My beloved Slice was laid to rest along with my monthly pizza column. 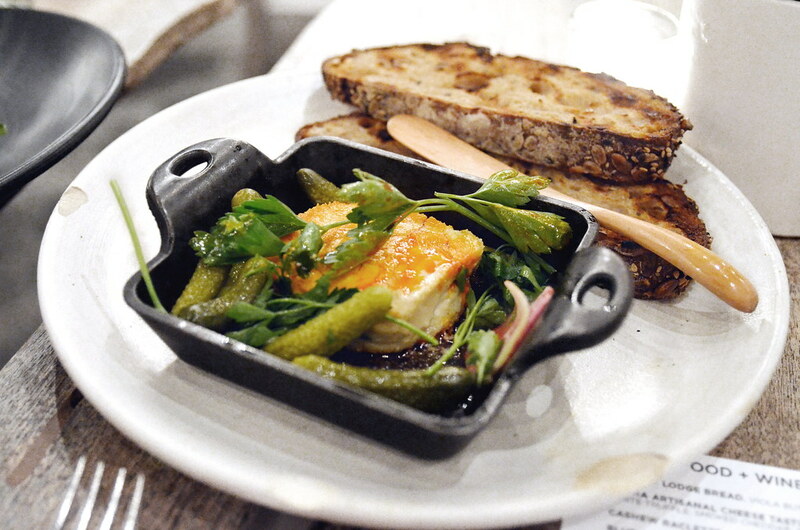 Unsure of future writing pursuits and research, I meandered through restaurant news in Los Angeles but have been mostly disconnected from it all. 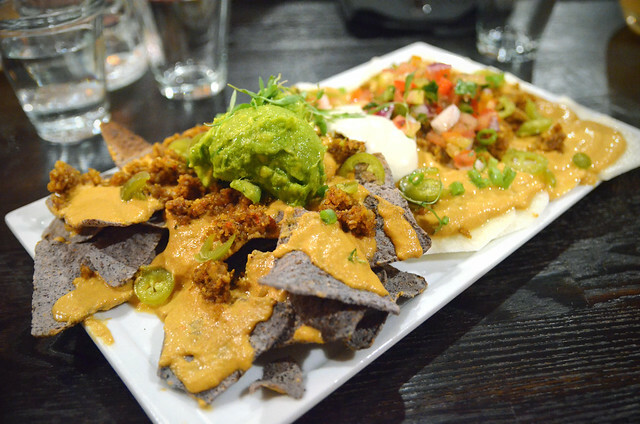 Slowly, the void filled with vegan food options research throughout Southern California. 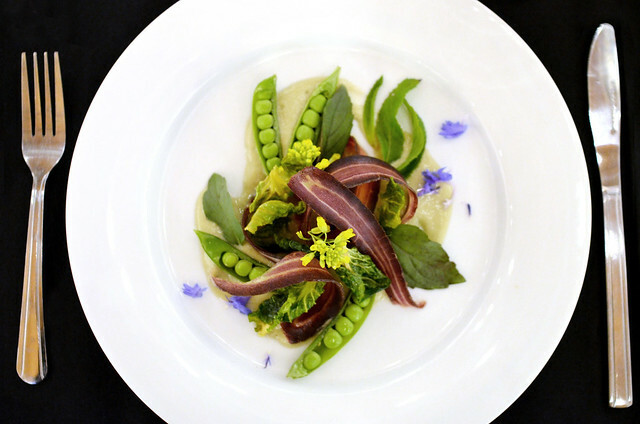 In the most lovely happenstance, just as I was feeling comfortable speaking on vegan dining options, The Vedge put out an open call for writers. I had a new writing home with a new vegan focus. The Vedge writers are a dedicated group located across the country who will be sharing national vegan food news and reports. 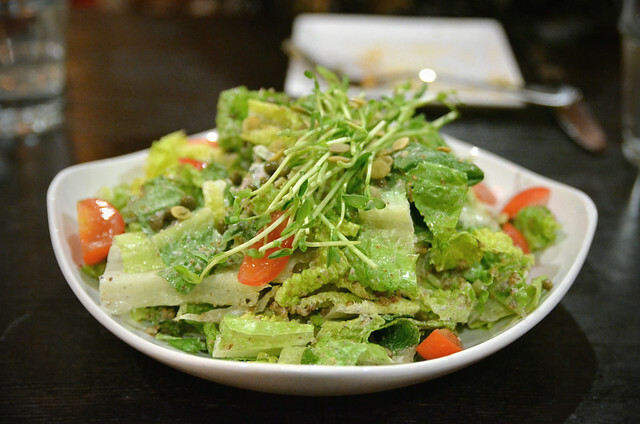 I’m thrilled with my first post, The Springs LA Combines Raw Vegan Food with Yoga, Music, and Pure Class, and look forward to sharing many more vegan adventures. Kimberly Helms (Co-Founder of The Springs) and Joyce Rockwood (Colon Hydrotherapist) sharing a sweet moment during our tour of The Springs. 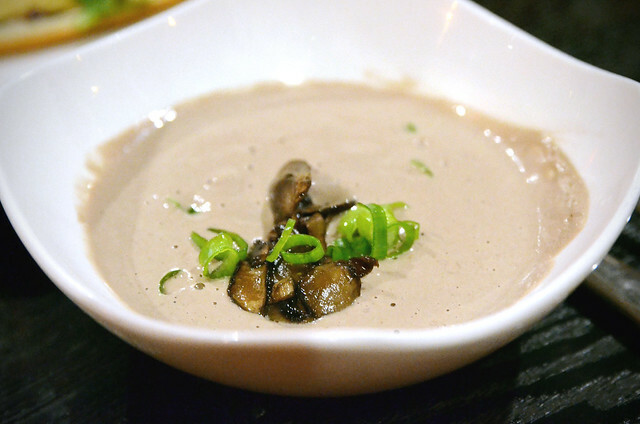 The Californication of Detroit’s popular vegan pop-up dinner series Chartreuse unveiled this month as the Zoetic Supper Club. 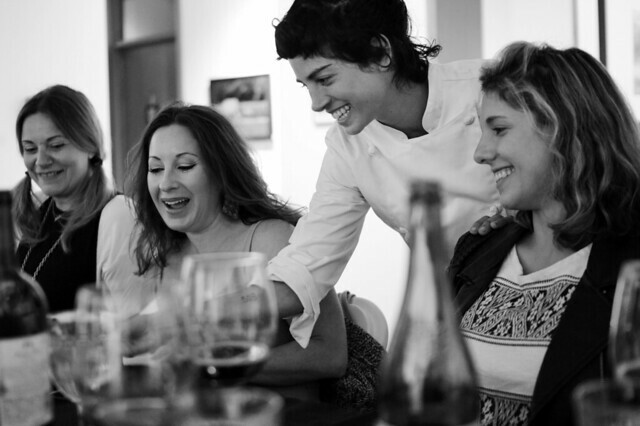 In the spring of 2013 Chef Corinne Rice moved to Venice, CA, bringing her organic, plant-based pop up dinners with her. 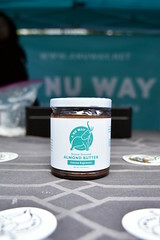 A graduate of the raw culinary Matthew Kenney Academy, her dinners express restrained elegance bursting forth with complex flavors that I’ve rarely encountered in raw vegan dining. 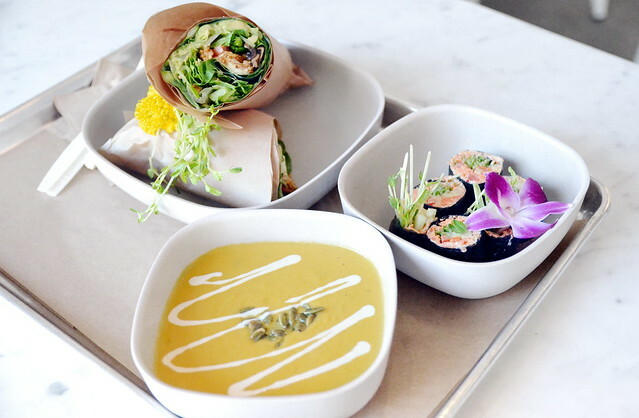 All of Zoetic menus are organic, gluten- and soy-free elegant displays of local produce and healthful intent. With roaming locations and musical accompaniment, each Zoetic Supper Club experience will be unique; no two venues, menus or musicians will ever be the same. I was fortunate to attend the very first of the series—held May 22, 2014 at the G2 Gallery—and enjoyed an evening with new friends and four artistically crafted courses. 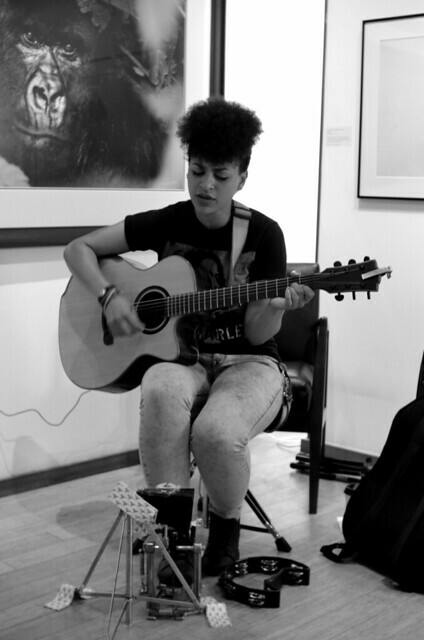 The incredible Sasha Mari played tunes for us throughout the evening; and through she has directly behind me her music was like a hushed secret in my ear. 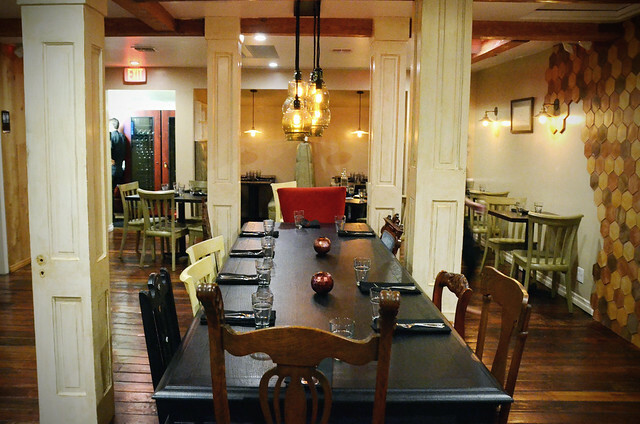 An intimate dinner like Zoetic brings together like minded people, so although I arrived alone, I carried on conversations with everyone around me. I left with the contact information of a found wood craftsman, a new found interest in exploring the culinary offering of Reno, NV and a new PETA-employed friend. At my seat I found a BYOB glass of wine and eatable words. 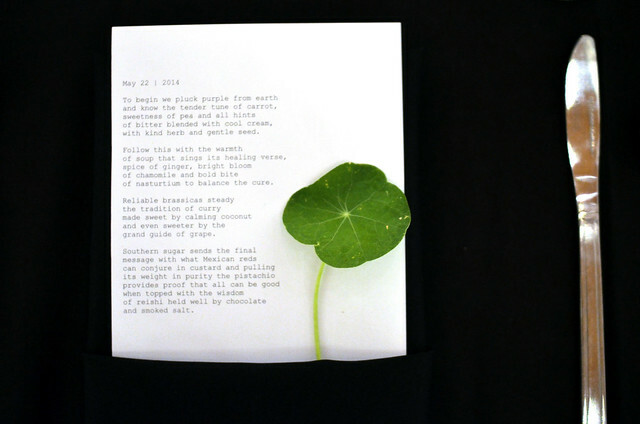 Nestled in each napkin was a poem by Jacqueline Suskin to guide us through the evening. with kind herb and gentle seed. of nasturtium yo balance the cure. and even sweeter by the grand guide of grape. first | purple carrots. peas. 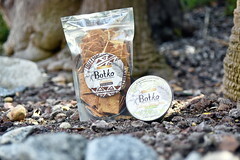 brussel chips. 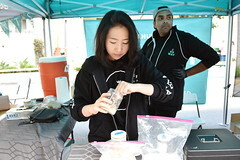 avocado cream. mint. basil. black sesame foam. This was my favorite dish of the evening. Young peas and floral herbs play so well together. But it was the curls of purple carrots, crisp and smoked with a subtle ‘bacon’ flavor that amazed me. 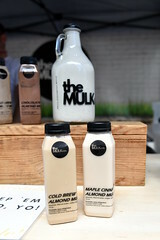 Before this meal I’d never encountered these flavors in raw food. Simply astounding! second | ginger. chamomile. nasturtium. The unexpected soup, different from the published menu. Afterward Chef Rice explained she felt the menu might be too puree-heavy so changed this course to a vivid vegan consommé. 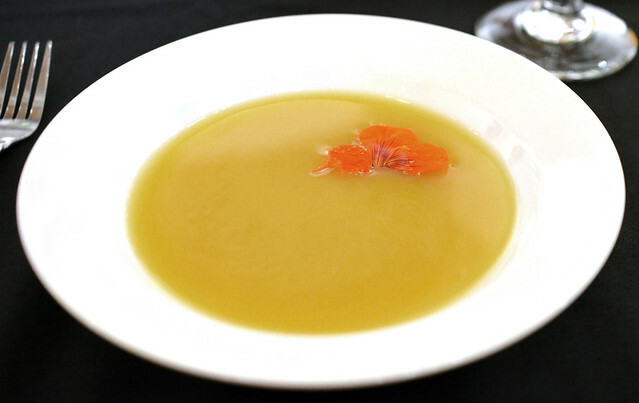 A mild broth with the heat of ginger and one peppery bite of nasturtium. third | brassicas. saffron coconut curry. cilantro pesto. grapes. 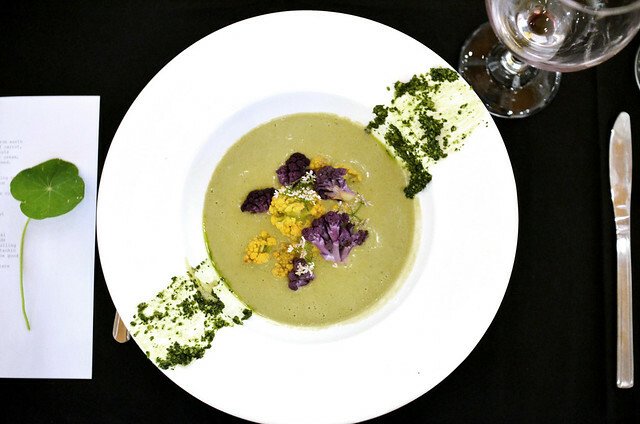 The pale green puree hide a simmering spice that lingered after every bite. 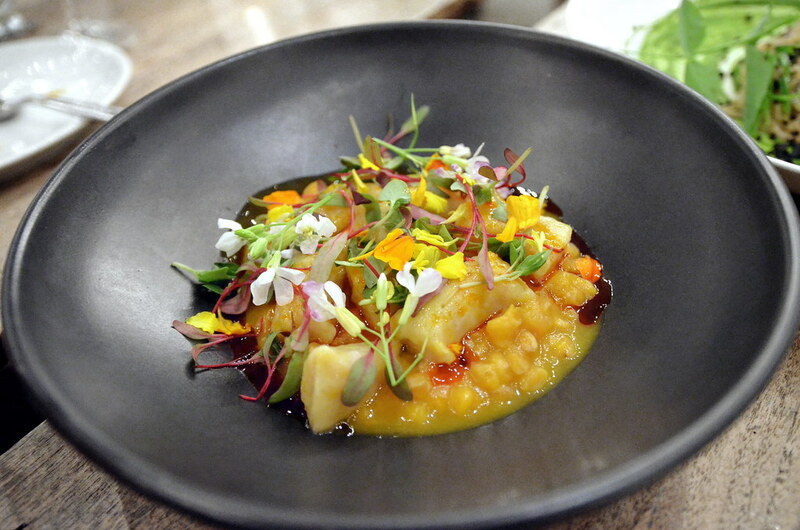 The plump florets of rainbow cauliflower, steeped in the coconut curry, were a satisfying end to the savory courses. I swept up every last bit of the cilantro pesto… with my finger! fourth | Mexican red velvet custard. pistachio pastry. reishi chocolate sauce. smoked salt. A stunning end. 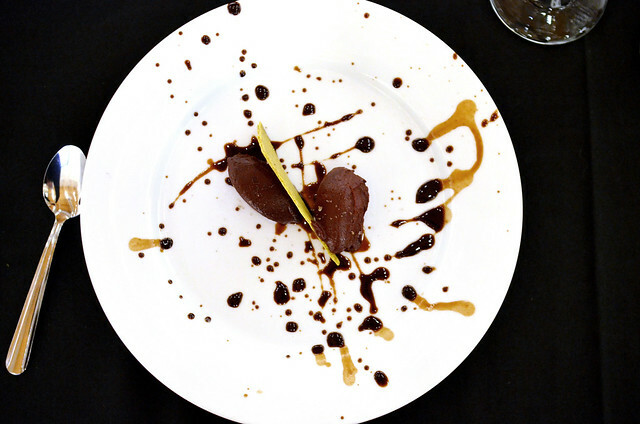 Two quenelle of raw chocolate custard splatted in chocolate relish—a ruddy mushroom—sauce holding a delicate pistachio wafer. It tasted as beautiful as it looked. 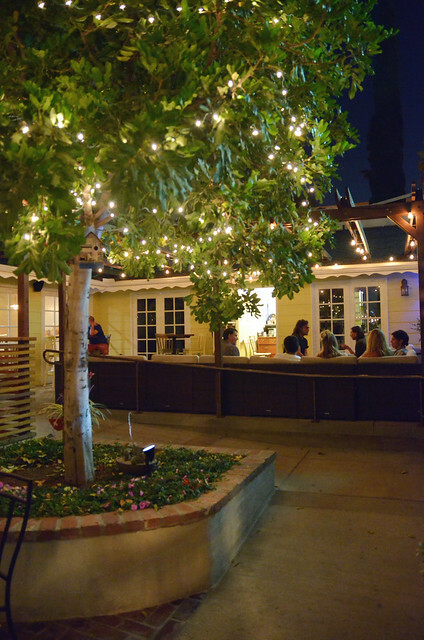 The next dinner will he held Saturday July 26, 8pm at C.A.V.E Gallery 1108 Abbot Kinney, Venice… and it’s BYOB!